I flipped over to CNN briefly this afternoon and heard a CNN anchor talking about France's new President Francois Hollande's proposal to raise the top tax rate on those earning more than a million euros a year to 75%. The host seemed absolutely shocked at that rate. To be sure, that is a lot compared to our current top tax rate of 35%, but a quick Google search would have provided CNN with some relevant context. See this chart from the Tax Policy Center, for instance. 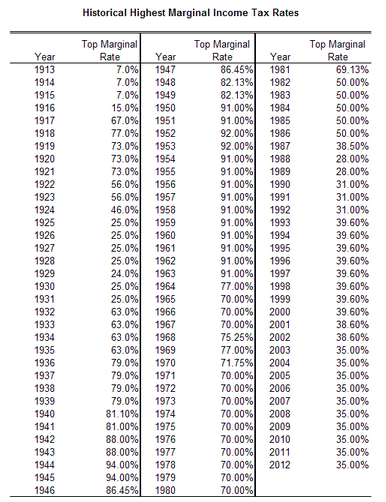 The US has had a top tax rate higher than 75% in over 30 of the past 100 years. The US' highest tax bracket maxed out at 92% ('52-'53), with 12 years of a 91% top rate ('50-'51, '54-'63). In the past 100 years 66 of those years have had a higher top tax rate than we have now, with our current top tax rate at 35%. Apparently we all have a short memory and lack the will to do basic research.